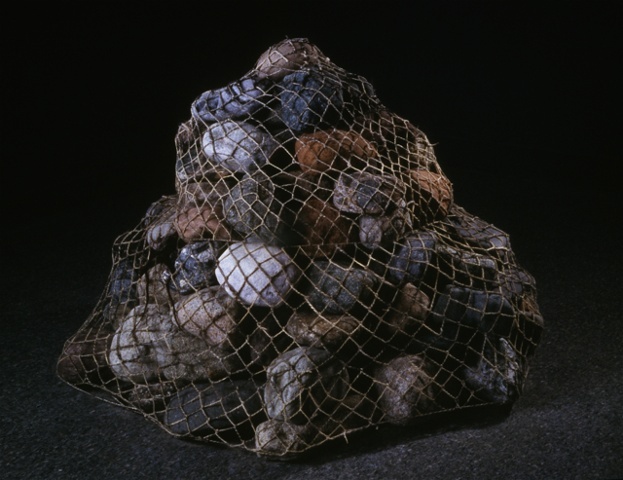 Painstakingly piled, round beach boulders, netted with handspun human hair and wool yarn dipped in beeswax. A one-time site-specific installation at the University of New Brunswick Art Centre. Next, I will try it outdoors. My grandmother told me once that she had secrets she would take with her to the grave, and I contemplated the weight of such things. This piece was also meant to reference old cairns, traditional grave markers often found on hills overlooking the sea. Also, the stone walls built in wire mesh that serve as breakwaters.